British author Alan Shadrake, whose book Once a Jolly Hangman: Singapore Justice on the Dock, was recently released, has been detained in Singapore on charges including criminal defamation and contempt of court. 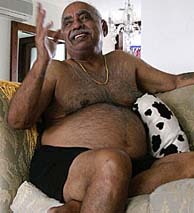 His book contained an interview with Darshan Singh, pictured above, the now retired head executioner at Singapore's Changi Prison. The book also features interviews with local human rights activists, lawyers and former police officers on various cases involving capital punishment in the city-state, which carries out the death penalty by hanging.